Jimmy Bullard has a new string to his ever increasing bow: World Record Breaker. Along with football freestyler John Farnworth, he now holds the official Guinness World Record for the 'highest altitude football dropped and volleyed into a target'. 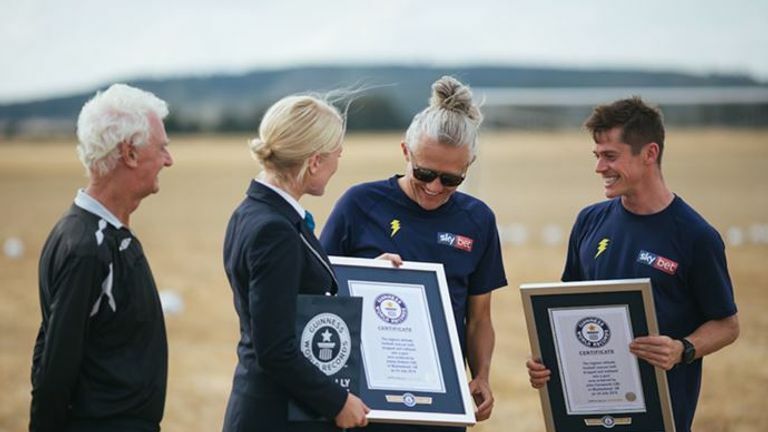 Farnworth, who already holds 10 World Records, was going up against Bullard in a challenge to see who could score a volley from the highest possible altitude. The World Record rules stated that the ball was only permitted to bounce once after the player had made contact, and any contact had to be made at least 11m from the goal line. The competitors began volleying balls from a specially created drone, which hovered above the striking area, before releasing a ball from a 30m (the minimum permitted attempt to qualify as a new record). After coming to terms with the variable wind conditions and unusual technique of timing a strike with a dropping ball, Farnworth drew first blood and knocked in a ball dropped from 32m - roughly equivalent to a 10-storey building. Never one to take things lying down, Bullard raised the stakes and enlisted the help of a Robson R44 Helicopter to take the stunt to the next level. The helicopter was flying at an altitude of 45m (13 stories), when Bullard connected with the laces of his right foot, sending the ball flying over the goal line and becoming a new Guinness World Record Holder in the process. Serial record-breaker Farnworth wasn't about to go down without a fight and also managed to smash one in from 45 meters, meaning that the new record was officially shared between them. Bullard and Farnworth received their certificates for the new World Record from the official Guinness World Record adjudicator Sofia Greenacre. Hit play on the video at the top of the page to see Bullard's world record!